The average cost for an assignment is around $120, but can be higher if a GUI is required (around $180). Although these costs sound high, it’s actually good value and I’ll explain why. We complete every assignment from scratch, without using any existing code, this means that the chance of you getting caught it much lower as it will pass any plagiarism detection software. Given that a course costs $6000, even if we completed all the assignments for you, it would add less than 10% onto the cost, and would save you the time and money to retake it. We use skilled programmers with long experience in programming, and so the costs are greater than if we used low skilled employees, but the results are far better. Although the skill of the programmers of higher, and the hourly wage is greater, we can complete the assignments at a much faster rate, so the costs are still reasonable. When I was at University we had an assignment to write a program to play 21 (Black Jack, Pontoon), and I complained that it was too easy (I managed to complete the original assignment in my lunch hour) so they added extra credit portions to it (I had been programming for 5+ years before I started at University). When I started programming games, I would write games in 100% assembly language, and the program would be about 50000 lines of code, and take 16 weeks, so that is around 600 lines of code per day. It is slower to write in assembly than other languages, so a skilled programmer could write about 1000 lines of code. If you just require tutoring we can also provide that, we charge on an hourly basis and can connect to your computer using Teamviewer so you can see exactly what we are doing and listen at the same time. ATA may be able to help you in class, but will not be able to work with you on your own home machine. We don’t just do programming assignments, but also essay based assignments as well. This is particularly handy if English is not your primary language, as that makes it harder to complete a long essay which is not only grammatically correct but also factually correct as well. We can normally complete assignments within 24 hours, but to be on the safe side, the earlier the better and that also gives you the chance to provide feedback, if you want any changes to be made. We have completed assignments in a few hours, but that really depends in people are available to work and can’t be guaranteed. We operate 24/7 but the fastest response is between 8AM-11PM PST, especially when it comes to quoting for an assignment rather than dealing with work in progress. 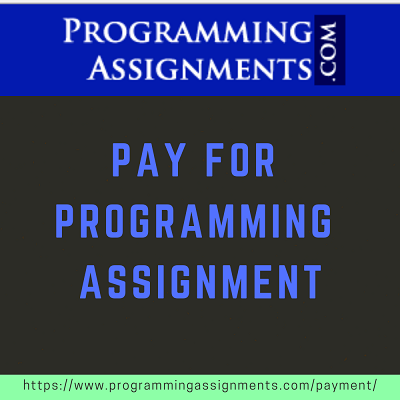 You can rely on Programming Assignments to provide let you pay for programming homework with a guarantee of money back if we are unable to complete it.